Besides numerous small-scale, predictive maintenance projects in 2017, the other emerging trend in the IIoT space has been partnerships with automation, hardware, software and cloud companies. 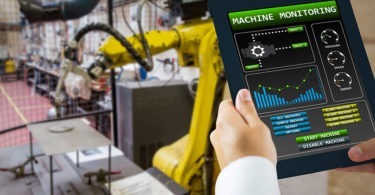 Activity is heating up as suppliers race to find the right partnership and provide manufacturers with “one-stop shopping” for real-time sensing platforms. OSIsoft LLC and Petasense recently announced a partnership with that offers manufacturers the ability to implement wireless sensors to older equipment and store time series and event-based data with OSI’s PI historian platform. According to Petasense, the Silicon Valley-based company offers an end-to-end IIoT based predictive maintenance system to predict the health of critical rotating machines like motors, pumps, and compressors. The platform includes a patent-pending wireless vibration sensor, cloud software and machine learning-based analysis of vibration patterns. Petasense’s software analyzes vibration characteristics and can predict common defects like pump cavitation, bearing wear and misalignment. The software produces a numerical machine health score, determined by ML algorithms in real-time. Petasense has already logged 25 billion wireless vibration readings across its client base, according to the company. Some of the vibration readings occur with Silicon Valley Power (SVP), a municipal electric utility owned by the City of Santa Clara has signed on to integrate OSIsoft and Petasense solutions. SVP monitors all its balance-of-plant (BOP) rotating machines with Petasense. “After a successful trial, we have now rolled out the Petasense solution to cover all our mission-critical rotating machinery,” says Paul Manchester, assistant plant manager at SVP. The integration of the two systems will enable SVP to correlate asset and process data and create predictive models that leverage vibration along with other process parameters, according to SVP. >> For more information on Petasense and OSISoft, click on the company names.